Looking at the shriveled up body of the old woman, Shovan shook his head. The room looked the same to a large extent, although the furniture had naturally been updated in these many years, which have passed since he saw this house for the last time. Apart from the dead body decked with flowers and placed on a very old mat covered with a pristine white bed sheet, there were few plastic chairs, a folding cot placed at the side of the room, a table with a bright sunmica top, covered with a transparent plastic sheet. The ceiling fan was moving at the minimal speed with an annoyingly creaking sound. The room was full of people, who were trying to find a place to stand. It was an awkward crowd unused to be in a shack like this; respectably dressed middle-aged couples, and four or five young person standing restlessly and almost all of them fiddling with their fancy cell phones. A slightly plump lady wearing an expensive-looking saree nudged her husband and whispered loud enough to be heard by Shovan, and probably by everyone else. The husband nodded and mumbled something else. Ranga Kakima, naturally, was Ranga Kaka’s wife. Ranga Kaka was Shovan’s father’s much younger brother. This particular uncle was called “Ranga” not because his personality had anything related to the fieriness of the colour red, which Ranga meant in Bengali. The three younger brothers of Shovan’s father were called Ranga, Shona and Choto Kaka, which except the last address had no link with their personalities. Only Choto Kaka was eponymous because not only he was the youngest of the brothers, but also a very young lad when most of his nephews and nieces came around to call him an uncle. But the wives were different. Shovan did not have the same level of intimacy with Shona Kaka’s family as he had with Ranga Kaka’s but Shona Kakima was really a golden woman, both in terms of her fair complexion and her golden singing voice. Her daughter, Khuku, went on to become a fairly renowned Rabindra Sangeet singer. Although mostly out of touch with the cousins on Shona Kaka’s side, once Shovan had met Khuku in Denver in an Annual Bengali Cultural Conference. “I am here because of my mother,” she had told Shovan emphatically. Her father was a manager in a local factory, and was never really interested in arts, or for that matter, the well being of the children. Ranga Kaka was not exactly like Shona Kaka, but forgetfulness, aloofness, uncertain tempers and self-centeredness were parts of the family legacy. He married late a woman about ten years younger than him. That woman, Shovan’s Ranga Kakima, turned out to be outstanding. There was no other way to describe her. “Are you a human being?” Shovan had asked her once with great trepidations. She had not answered. She was nor extremely beautiful, and very fair like Shona Kakima; neither was she an extremely devoted housewife with great entrepreneurial skills of managing the household, which Shovan’s mother possessed. But there was an aura around her that made her appear like Goddess Durga during Durga Puja; and also Laxmi, Saraswati and Ma Kali during their respective worshiping; and also like the painted women escorting clients in the lanes of Sonagachi, which Shovan would sometimes visit with his friends in his college days. However, Ranga Kakima was not be confined within the goddess, and whore opposition—she spilled out; and left a lot of residual benedictions that showered upon her children, her husband, and in the brief spell when Shovan was a lover of this ethereal creature, also upon him. Lover, the word resonated in Shovan’s mind. Was he really a lover of his aunt? Her aloofness was not like the distancing that characterized and also suited the learned school teacher demeanor of Ranga Kaka. It was something grand—the aloofness of a queen. A queen looks after, and looks down upon her subjects simultaneously. “We were all happily enslaved by her,” Shovan thought. As the vision of Ranga Kakima in her prime flashed before his eyes, strange warmth spread through his seventy year old body; but instead of being violently shaken by its libidinal earnestness, Shovan felt peaceful. Yes, Ranga Kakima’s memories brought peace to him now. However, in his youth, when he came to live with Ranga Kaka’s family in their tiny hovel in Park Circus, Ranga Kakima not only evoked peace but also excitement. Their house had two rooms—one of them also accommodating the kitchen without any walls. Ranga Kakima lived in this room with their three small children—the youngest little boy around eleven months old. Due to the lack of walls, the kitchen was barricaded from the rest of the room by two strong nylon ropes running parallel to each other. Having born into a family which experienced displacement at multiple moments in history, the children were perhaps naturally equipped with a heightened sensitivity to borders; and none of them crossed that flimsy barrier and no major accident happened despite the risky setting. Shovan lived with Ranga Kaka in an even smaller room, which could not accommodate two cots. Therefore, the nephew gallantly offered to sleep on the floors. The arrangement was fine during the winters when all you needed to do was to fall asleep amidst the comfortable heap of mattress and blankets. But in the summers, the house could really heat up. Although, in the aforementioned circumstances, sleeping on the floor in the summer seemed like a welcome arrangement rather than sleeping on Ranga Kaka’s rusty bed; but Shovan almost felt suffocated mostly due to the large figure of Ranga Kaka tossing sideways in his bed to combat the heat and occasional mosquitoes passing through the mosquito net. The bed, in its turn, would make frequent sounds in futile protests. One day Shovan could no longer bear the sound and the fury; took his bed sheet in one hand; and rushed to the little, secluded terrace, which seemed to be the only luxury that Ranga Kaka’s modest rented house could offer his young family and nephew. And there, he beholds her. As he was a permanent guest in his uncle’s home for almost two and a half years, he had grown familiar to Ranga Kakima’s habitual presence in his life; but this sight was not a routine, everyday encounter. Ranga Kakima was sitting on a mat with her back to Shovan; with her long, black tresses open and emanating an unearthly, beautiful smell of exotic oil. Shovan fell in love with her on that day. Shovan was no naïve youth. At twenty he had seen a lot, including the near murder of his father in a petty brawl with his trusted Muslim barber due to the difference of opinion regarding the length of the beard. Shovan’s father had gone for his routine haircut; and the old barber in a senile moment refused to trim his beard after the haircut. Shovan’s father’s infamous anger flared-up at perceiving a change in the attitude of his natural subordinates; and in his rage, he might have expressed certain unflattering remarks about the longer beards of the Muslim community. The old barber without any apparent hint slashed the neck of his esteemed client with his barber’s knife. Although the attack was not fatal; and the barber was eternally remorseful after the incident, which led to Shovan’s father not pressing any juridical actions against him, this incident changed his son’s life forever. His father decided that his children are no longer safe in East Pakistan amidst an alien religion and language, which had disturbed the familiar equations in the neighborhood beyond repair. They must go to India to become its citizens. His younger brothers and the extending family had already migrated to India in 1947; there was no point in continuing the legacy and the root of the family in Dhaka. He was too old to move and adjust to a new city; but the children were still young and mobile. Shovan’s twin sister was married at seventeen to a young doctor in Calcutta. He was to shift base to Calcutta to pursue higher education in Physics at Presidency college; and stay, due to lack of alternatives, suddenly in an impoverished manner with his Ranga Kaka, who was a teacher in a local school. So, Shovan had seen hard times; and was not easily susceptible to the beguiling fantasies of early youth. He was a meritorious student; but he knew that these sudden turn of events had abruptly put an end to his dreams of higher education, and a life of rigorous academics. He needed to find a job so as not to burden his uncle’s family; and his elderly father, who was ageing far more quickly due to estrangement from his children and his familiar ways of life. Therefore, Ranga Kakima’s spellbinding presence for Shovan was not an adolescent fantasy. For many nights Shovan would just sit beside her and look out in to the sky gauging the expanse of it through his trained, scientific mind. But he failed miserably—the night sky was mystique and only Ranga Kakima seemed to be capable of finding ways through its light-years. As he sat beside her, Shovan could understand that Ranga Kakima was traversing space; and moving away from this little spot on Earth. It was not an escape, but they were spreading out. She was lifting herself and also through her power of will, Shovan, out of pettiness, poverty and suffocation. These sessions would be very intense—and when Shovan would wake up huddled up in the terrace in the morning, completely drenched in sweat, he would feel the exhaustion of a much travelled man— the immense fatigue and satisfaction of someone who has climbed Mt. Everest, or travelled the world in a nanosecond, or the exhaustion and expanse of a galactic traveler. However, his guide to these celestial journeys was an extremely silent companion. Not a word was exchanged between them during their nightly sojourns. In the morning, everything would be the same— as Shovan would wake up, he would find Ranga Kakima completely immersed in the household work—tending the children; instructing the maid; cooking the meal that he and Ranga Kaka would eat before they start for the day. Meanwhile, the summer changed to winter, but these extraordinary and quiet nocturnal excursions continued undisturbed. Shovan was also on the verge of graduating from college; and had managed to get a job as a school master in a local school for the time-being. Although it seemed that he was hitting a wall; and coming to a dead end to his dreams of making it big, he felt elated and extremely buoyed up. He slowly understood that the real world in which it seemed he was getting trapped could be transcended when he was in company of Ranga Kakima. In one of these uncertain days, their relationship took a step forward. The nights were getting chilly with the winter approaching; and Shovan was worried about the health of his powerful sorceress whose mind could originate cosmic travels, but her body was still human and susceptible to the icy winds and the fall of temperature. Shovan had offered her a shawl out of such corporeal concerns; but it was fated to be a symbolic act of generating warmth, which finally broke the enigmatic silence. Ranga Kakima’s favorite possession in those nights of isolation was the mat on which they would sit, a humble madur, which served as their surrogate flying-carpet. “This mat was given to me when we were fleeing the riots of Noakhali a year before the partition.” she said wistfully. Shovan was eager to take the conversation forward. There was a strain on Ranga Kakima’s face, which he found disturbing. He now wished that the conversation would end very soon. Shovan observed that Ranga Kakima was lost in the tale she was narrating simultaneously enacting her part as if the old woman was standing in front of her and she was reliving the moment once more. “This is the mat?” Shovan asked. The tale was incredible, but what he had experienced in the last six months was nothing short of marvelous. And it was possible that in those violent times in Noakhali, when human values ceased to operate, fairy godmothers, along with beasts and demons, might have come to life in large numbers to help the local Cinderellas in a gory, subverted enactment of the tale. Shovan was eager to know more. “This is the mat?” he asked once more. They could also consummate their reclusive love that night without waking up the family and the neighborhood of their communal sleep. It was difficult for Shovan to keep his commitment of visiting India every year even ten years earlier, primarily to keep contact with his sister and her family settled in Delhi. After he left Calcutta for pursuing doctoral research in the US, his ties with Ranga Kaka’s family and the city of Calcutta was severed very abruptly. Many years ago, inspired by the flights to which Ranga Kakima had given him access, he had earned a prestigious scholarship for pursuing higher studies faraway in the US; and had settled down there to gradually rise to the position of a prominent Research Professor in a top university. His American wife, Sandra, did not like travelling and stayed back in most of the trips that Shovan would make to India or elsewhere. Now, advanced age resulting in much less work but not yet giving rise to dreaded geriatric conditions had once again turned Shovan in to a footloose traveler. Ranga Kakima had died a respectable death at eighty-two, outliving her husband by almost fifteen years. Her children were all well-established. The eleven month old boy was above fifty now and worked as a top executive in a renowned MNC. However, none of them had informed Shovan about their mother’s death. They had informed his sister in Delhi. Shovan was coincidentally visiting her for his annual trip to India. Shovan had always felt that Ranga Kakima’s children perhaps had an inkling of the affair between their elder cousin and their mother. Perhaps, they had heard rumors growing up; or the older ones could intuit it. Ranga Kaka would not tell them anything, even if he knew. Looking back, Shovan felt that it was impossible for him not to be aware of an affair blooming in his house especially due to the extreme lack of private space. However, it was also not beyond Ranga Kakima to enchant the little space of the terrace so that everything happening there could be kept away from the rest of the house and the neighborhood. Sometimes Shovan felt unsure of those months because they seemed to be erased from everywhere else apart from his memory. As Shovan heard about the death, he directly flew to Calcutta. And despite his long absence from the neighborhood, which had transformed itself to a great extent, managed to find the Park Circus house where his sister was told that the body would be kept before being cremated. Ranga Kaka had eventually managed to buy this house, which was now kept by their affluent children only as a memorial of their childhood and the struggles of their parents. Now that both the parents were dead, perhaps real-estate profit would overpower childhood nostalgia; and the house would be sold off to the eager promoters waiting since ages to transform the local cluster of houses in to valuable property. He did not mind at all. Ranga Kakima was lying on the same mat. Apparently the children were aware of their mother’s obsession with this relic from her forgotten past; and had honored her wish to make it a part of her last journey. The room was too crowded now. Shovan was feeling suffocated and went out of it to offer his place to the other relatives, none of whom he recognized, who had come to pay their last respects out of a sense of duty, which one feels when a very old woman dies peacefully in her bed. After distancing himself from the slightly dubious scene of grief, Shovan felt relieved. It was definitely possible that the person lying dead on the mat was counterfeit; and the mat was also fake. Ranga Kakima must have gone away riding her mat many years earlier, before she started resembling the old woman who gave her the mat. Or maybe, she would straddle both the worlds with remarkable ease, the way she was doing when Shovan was around to witness her enchantment. Perhaps there was a retirement age—Ranga Kakima might have found a protégé in a lucky young woman and might have relayed the mat before she settled down to a happy domesticity. Shovan remembered the final night before he left for the US when Ranga Kakima had held his hand for the last time. “Are you a human being?” Shovan had asked impassionedly. Ranga Kakima had not answered. Shovan understood that the last journey of Ranga Kakima amidst this middle-class conventionality was an empty gesture because she had never settled for the life, and also the death that was offered to her by our insufficient world. 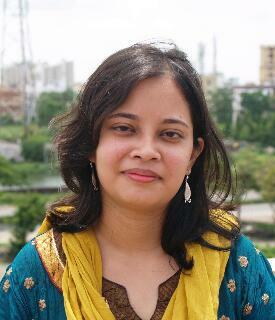 Author’s Bio: Madhumita Roy is working as a faculty of English in a college in West Bengal, India and pursuing PhD at IIT Kharagpur. She is an Indian and lives in Kolkata with her family. Her academic works have appeared in journals such as The Journal of Commonwealth Literature, Glocalism: Journal of Culture, Politics and Innovation, and The Journal of Urban Cultural Studies. Her creative works have found place in Out of Print, Reading Hour, Indian Review, The Bangalore Review, Word Riot, Brilliant Flash Fiction, and Flash Fiction Magazine.